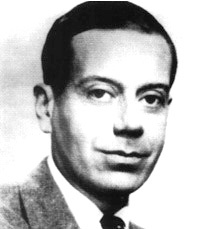 Cole Porter was born in Peru, Indiana on June 9, 1891. He was the only surviving child of Samuel Fenwick Porter, a druggist, and Kate Cole. He began studying music - violin and piano - at a very early age, and by ten he had written his first song, "Song Of The Birds". In 1902, his mother had his composition "The Bobolink Waltz" privately published. Porter was sent to Worcester Academy in Massachusetts, for prep school, and he entered Yale in 1913. There he became a famous figure on campus, writing two of Yale's best known football songs ("Bingo Eh Yale" and "Bull Dog"), and supplying the songs for several Yale Dramatic Association "smokers". Upon graduation he was voted the most entertaining member of his class; he also received votes for being the most original and most eccentric. See America First, Porter's first Broadway show, opened in 1916. It ran for a dismal 15 performances. It may have been the failure of the show which prompted him to sail to France. He was attached to. a relief organisation in France during World War 1, and seems to have spent a good deal of the war enjoying himself in Paris. In 1919 he wrote several songs for Hitchy Koo Of 1919, among them "An Old Fashioned Garden", his first popular hit. Also in 1919 he married the wealthy socialite Linda Lee Thomas, who was at one time considered to be the most beautiful woman in the world. Cole and Linda had a long and happy marriage which lasted until her death in 1954. The Porters spent much of the 1920s living in Europe amongst the "lost" generation of writers, artists and intellectuals. They were renowned for their lavish lifestyle and party giving. Many regarded Cole as little more than rich dilettante who wrote amusing party songs about his friends. However, Porter took his music seriously, studying at the Schola Cantorum in Paris. In 1923, Porter wrote the score for Within The Quota, an ambitious jazz ballet staged by the Ballet Suedois, with Gerald Murphy as the librettist. As the 1920s came to an end, Porter finally began to achieve real success on the Broadway stage. Paris (1928) which introduced "Let's Do It, Let's Fall In Love", was followed by Fifty Million Frenchmen in 1929, whose score yielded up such treasures as "You Do Something To Me" and "You've Got That Thing". Porter style became recognisable as a sophisticated blend of sensuality, wit, and innuendo. The 1930s were Porter's Golden decade. He had a string of hit shows, among them The New Yorkers, Gay Divorce, Anything Goes, jubilee, Red Hot And Blue, and Dubarry Was A Lady. He also wrote the score to several wonderful Hollywood musicals, such as Born To Dance and Rosalie. In 1937 Porter suffered a crippling horseback riding accident. His mother and wife talked the doctors out of amputating his legs, as they were sure such a blow to his vanity would kill him. For the rest of his life, despite over 30 operations, Porter was to suffer almost constant pain. His remedy was to lose himself in his work, and the early 1940s saw a number of hit shows - Panama Hattie, Let's Face It, and Something For The Boys. However, the mid 1940s seem to find Porter faltering, and in a profession where your only as good as your last show, he was considered washed up. Then, in 1948, he scored his greatest triumph with Kiss Me, Kate, a show which portrayed the backstage bickering of a couple of ham actors as they produced Shakespeare's "The Taming Of The Shrew". It was a brilliant success and ran for over 1000 performances. It is still widely performed today, and, along with Anything Goes, it is one of Porter's most popular scores. Porter had several more hits up his sleeve - Can-Can, Silk Stockings, and High Society were all produced in the 1950s. His last score was for a television "spectacular" of the Aladdin story, in 1958. The last year of Porters life were sad ones. He finally had to have one of his legs amputated in 1958, and after that he led a lonely and reclusive life. In 1960 Yale honoured him with a Honorary doctorate. He died in October of 1964 in Hollywood.